Amazon is celebrating its #1 ranking in customer satisfaction by the ACSI! Today, March 16, Amazon will donate 5% (10 times the usual donation rate!) 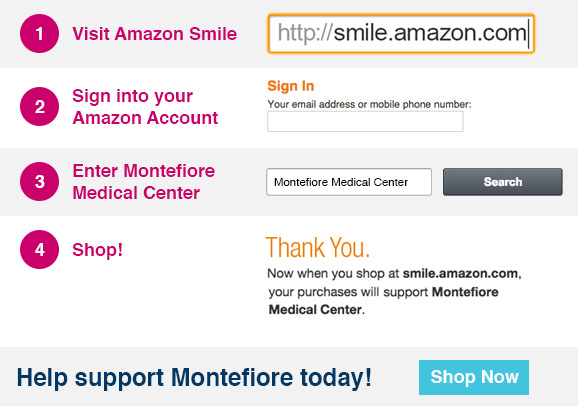 of the price of your eligible AmazonSmile purchases to Montefiore. Simply follow the steps below to get started. It costs you nothing and 100% of the funds received from Amazon go directly to support Montefiore. This offer begins at 12:00 AM Pacific Time, and expires at 11:59 PM Pacific Time.